Taken at sunrise in late September, Moraine Lake is nestled in the Valley of the Ten Peaks (Wenkchemna Peaks) 15 km (20 min) from Lake Louise Village. The road is only open from late May until early October. 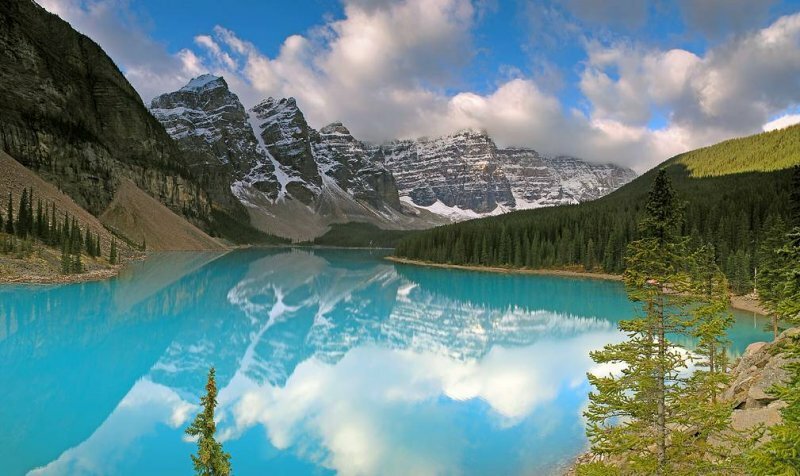 Numerous glaciers, lakes and majestic mountains combine to make the Moraine Lake and Lake Louise area one of the most photographed and visited locations in the Canadian Rocky Mountains. Its iridescent turquoise colour has earned Moraine Lake the designation, "Jewel of the Rockies," and its intoxicating beauty entices guests to return time and time again. This picture is surreal! I would not believe it was real, except that I visited it about ten years ago. Great picture. Wow. Nothing else to say. Just wow. Perfect landscape!!! Big my vote!! Love the colors, WOW nothing like the Oly colors..
Great picture, love this lake! Excellent work... We spent 2 weeks in Banff and Jasper in September last year (2005). We are now talking about retiring to the west. Very nice light, colors & composition. As if you really need another comment, but that photo is SIMPLY STUNNING!! What remarkable country and you photograph it so well. Darn nice, Gary, Super shot. Voted. Beatuful! Got chicken skin first time I saw it. The Color of the lake is sureal. This one gets my vote. What a beautiful shot. Wonderful gallery. stunning. i can't get over how clear and blue that water is. This is a jaw-dropping, absolutely gorgeous photograph, Gary! An amazing view. Well done. Just about perfect; really stunning image gary. Thank you Cindy. No, the C8080 is not a SLR. Here is a link to a review on it. Wowser, this is absolutely stunning, what a wonderful picture, I have not heard of the C8080, is it an SLR?? seems to float right there. Nice. This is such a great shot and I'm also very impressed with your skill at stitching it together. You sure have a gift for creating some great artworks. What a wonderful scene, and excellent shot, of course!!! Nice pictures. You make that camera sing for sure. I sure wish we would have had weather like that for our trip. Never saw the sun shine on the 10 peaks the entire 4 days we were in Lake Louise. Thanks for the email message also. Wow, incredible scenery and excellent stitch. Thanks for sharing the Rivendale of Cananda. Beautiful scenery, excellent place to take picture. Only the sky seems to me to blue/red and maybe to strong color. Terrific pano. Love the light and the reflection. Excellent colors and wonderful composition! I think that could be arranged Gayle. It is a beautiful area and glad you like it. Another amazing photo. I'm coming to visit! Do you hire out as a photo guide?